Shane’s official foray into winemaking took place in 2001, although the seed was planted many years earlier when his family established their Adelaide Hills vineyard. A previous career path (marine biology and aquaculture) brought him to Tasmania where he took up a vintage cellarhand position to help pay the rent whilst undertaking post-graduate research. Two weeks into harvest and he was hooked! From his new home base in Tasmania, Shane completed the Adelaide University post-graduate degree in winemaking and embarked on vintages in the Adelaide Hills, Yarra Valley and Oregon (USA). The passionate and dynamic winemaking community in Tasmania, and the enormous potential for discovery, lured him back. Fran joined Shane in their Delamere Vineyard business in 2011. 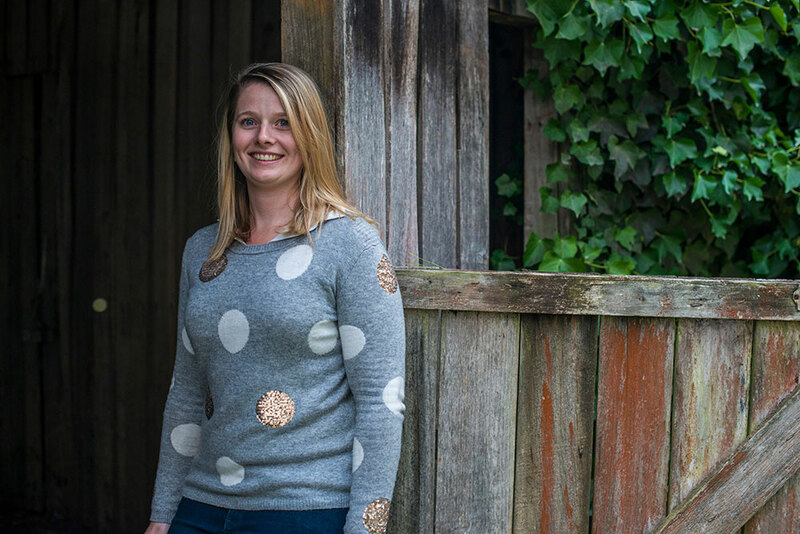 Relocating to Tasmania from her home state of Western Australia a decade earlier to pursue a passion for cool climate wines, Fran’s interest in Champagne style wines trace back to her days studying winemaking at Adelaide University. 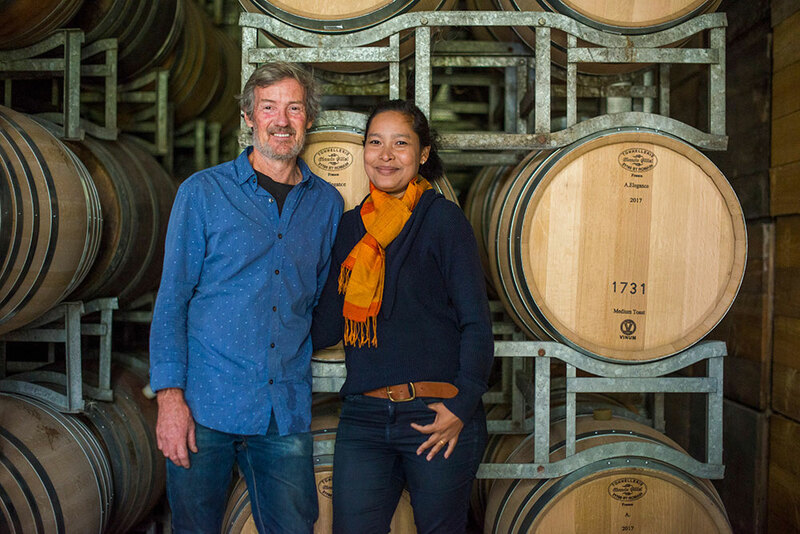 With many years of winemaking experience in top wine regions around the world, including Burgundy, Oregon, Yarra Valley and the Adelaide Hills, Fran chose to settle in Tasmania due to the unparalleled fruit quality. Who would have predicted a girl from Kalgoorlie would end up making cool climate wine in the apply isle? Not many! But certainly there is no place Fran would rather be. Fran was the 2005 Gourmet Traveller Young Winemaker of the Year, 2009 Len Evans Tutorial Scholar and 2016 Don Martin Fellow. Alice joined us here at Delamere in 2015. She brings with her a fierce passion for wine, a deep knowledge of our region, military-like organizational skills, and a seriously fabulous shoe collection. (You can see why we hired her!). But don't be fooled by Alice's graceful appearance and hospitable nature: She is no push-over. When it comes to the Delamere Block 8 allocation—Well, let's just say your allocation is safe with Alice. Alice's primary objective is to look after you, our loyal Wine Club Members and customers. If you have any question about wine availability, orders, or any Delamere wines you have carefully tucked away in your cellar, Alice would be delighted to hear from you. 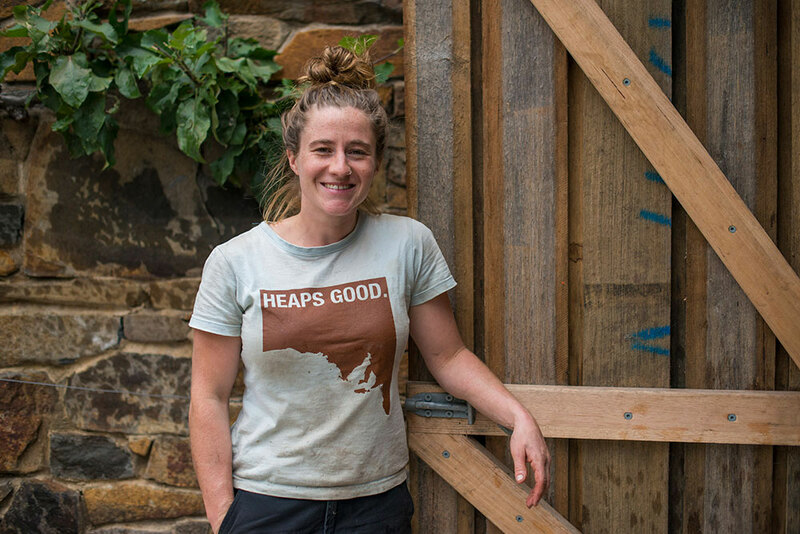 Hannah, a proud South Australian and talented winemaker, honed her trade over the last decade in Tasmania, Oregon, Central Otago and McLaren Vale. We have long suspected that Hannah defies the laws of physics; how can that much energy be crammed into such a small package? When Hannah is not making awesome wine she rides dirt bikes, produces leather accessories, bakes novelty birthday cakes, and raises goats. Known in some circles as ‘The Goat Whisperer’, later this year Hannah plans to move out of her perfectly sound, waterproof house to live beside it in a home-made tent. Close planted, on the side of a steep freezing cold hill, Delamere is a vineyard that demands to be managed 100% by hand. Delamere Vineyard is planted exclusively to Pinot Noir and Chardonnay on rich ironstone soils. The deep red Ferrosol soils offer great fertility, good water drainage and moisture retention, alleviating the need for irrigation. The combination of soil and site are perfectly suited to these two noble cultivars. The vineyard was planted at 7500 vines per hectare and has a cane-pruned, vertical shoot position trellis system, with a very low fruiting wire at 60cm off the ground. The low yield per vine and the reflective heat from the ground produces wines with superior depth of flavour and ripe, well-developed tannins. Vine age and subsequent natural balance are key factors in the consistent production of wines with great structure and harmony. The region of Pipers River in the north east of Tasmania enjoys a significant climatic advantage that is unique in Australia; that of a very low diurnal range. This temperature stability is born from a unique set of geographical features. The waters of Bass Strait cool the hot northerly winds, while the cool southerlies gain heat as they cross the island. Cool temperatures and significant sunshine hours make for ideal conditions to retain delicate aromas in our fruit. The frosty and sometimes wild conditions of winter give way to clear, crisp, blue-sky days through the growing season, allowing the fruit to ripen slowly and evenly, assuring the lingering acidity essential to producing premium cool climate wines. In 2013 we expanded the vineyard, planting an addition 6 hectares, taking our total planted area to 12 hectares. Penfold 58 Small berries (hen and chicken), concentrated flavour and texture with fine structure and long palate. Most likely originated from Penfolds Wybong vineyard, SA.